The General Plan Vision and Mission statements were prepared by the General Plan Task Force and subsequently adopted by the City Council prior to the development of the goals, objectives, policies and implementation programs by the General Plan Task Force and the City’s planning consulting team. The statements guide the formation of programs and policies that are included in the General Plan. 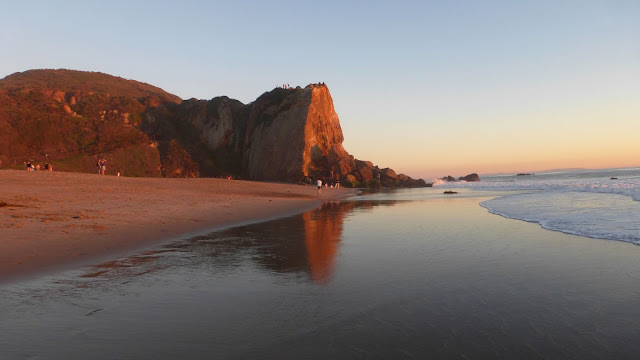 Vision Statement—Malibu is a unique land and marine environment and residential community whose citizens have historically evidenced a commitment to sacrifice urban and suburban conveniences in order to protect that environment and lifestyle, and to preserve unaltered natural resources and rural characteristics. The people of Malibu are a responsible custodian of the area’s natural resources for present and future generations. Mission Statement—Malibu is committed to ensure the physical and biological integrity of its environment through the development of land use programs and decisions, to protect the public and private health, safety and general welfare. Malibu will plan to preserve its natural and cultural resources, which include the ocean, marine life, tide pools, beaches, creeks, canyons, hills, mountains, ridges, views, wildlife and plant life, open spaces, archaeological, paleontological and historic sites, as well as other resources that contribute to Malibu’s special natural and rural setting. Malibu will gradually recycle areas of deteriorated commercial development that detract from the public benefits or deteriorate the public values of its natural, cultural and rural resources. 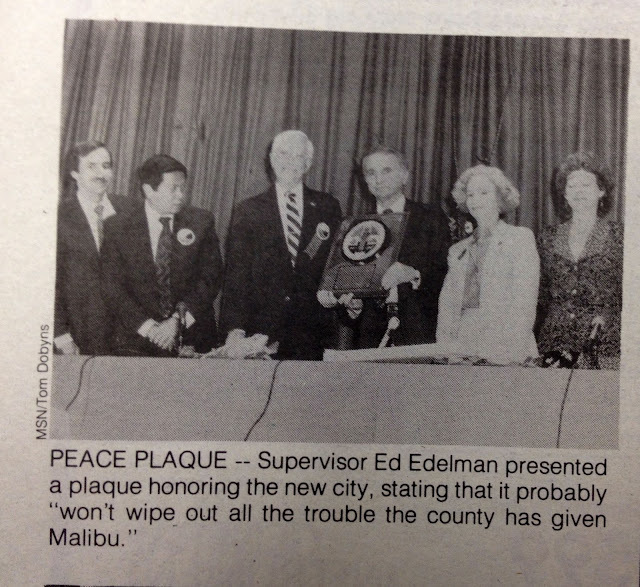 On June 5, 1990, the City of Malibu became a reality. After three decades of fighting Los Angeles County, and three failed attempts at incorporation, residents overwhelmingly passed Measure Y, the ballot initiative that gave Malibu its independence. It was a brutal marathon of a battle (you can read the details here), but optimism was in the air in the months following the landslide vote. A mission statement was drafted and the future never looked brighter. The first Malibu City Council, in a 1991 photo by Tom Dobyns for the Malibu Surfside News, blissfully unaware of the Pandora's box of troubles before them. Things fell apart almost at once. Instead of uniting to make the mission statement a reality, the first city council—men and women who fought ferociously for cityhood—fell out. 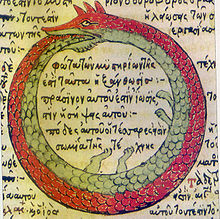 A bitter rift developed, one swiftly exploited by development interests. "Malibu's warring political factions, whose disagreements are rooted in petty rivalries, each have pitched the election as a plebiscite on development," wrote Los Angeles Times reporter Ron Russell on April 2, 1992. "The minority and their supporters insist that the majority has sold out to development interests, something the majority vigorously denies. Meanwhile, the majority accuses the other side of wanting to turn back the clock completely on development, which the minority disputes. "The result has been a sharply divided City Council that critics from each side say has been ineffectual, leaving Malibu severely polarized barely a year after it officially became a city," Russell stated. "We're finally going to have a city government that is responsive to this community," Councilmember Carolyn Van Horn told Russell when the dust settled. She, with challengers Jeff Kramer and Joan House "trounced 17 other candidates Tuesday—including two incumbents—to win four-year terms on the City Council," Russell wrote. If you disregarded the date and replaced "frustrated by the county" with "frustrated by the city council," and "Cityhood June 5" with "city council election November 8," this 1991 Malibu Surfside News cover could be reused this week. 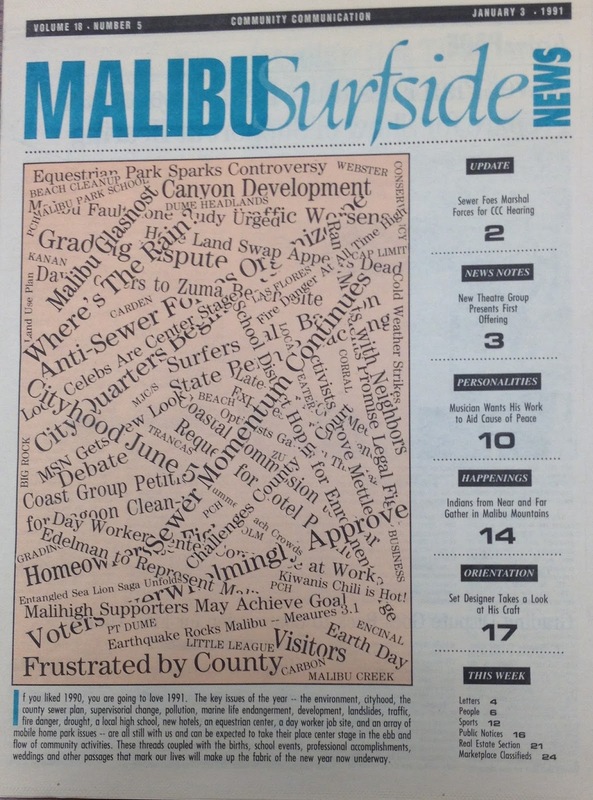 A quarter of a century after incorporation, Malibu is still fighting many of the same battles. The Malibu Mission Statement and what it stands for is really at the center of the rift that developed. The side that favors a looser interpretation of the mission statement is unofficially known as The Malibu Machine. It isn’t really a machine so much as a well-organized group of like-minded people who share a common vision. Unfortunately for those on the other side of the divide, achieving that vision all too often seems to involve inverting the Malibu Mission Statement by agreeing to trade some of the area’s “unaltered natural resources and rural characteristics” for some of the “urban and suburban conveniences” we are not supposed to want. 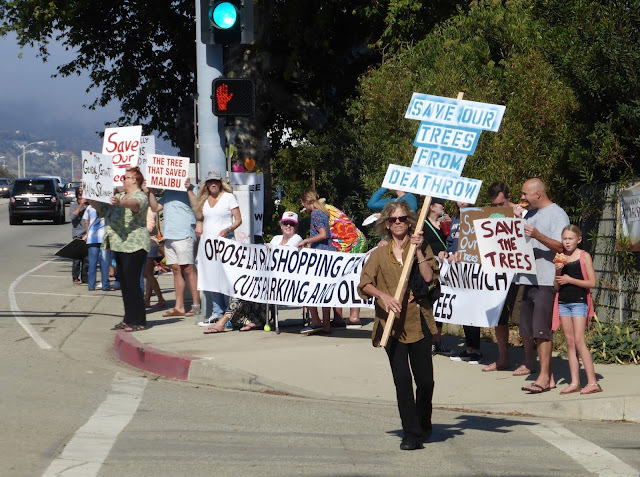 Opposing the so-called Machine is a group of community activists comprised of Malibu residents with occasional help from non profit environmental organizations like the Sierra Club and the National Resource Defense Council. 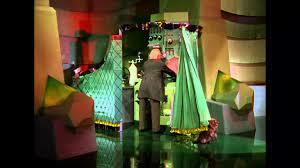 Every time there's a council election the machine wheezes and clatters into action. In 2002, council candidate Beverly Taki told the Malibu Times that "Most Malibu voters don't want a political machine running our city government, therefore, they are voting for me, an independent candidate." At the two recent candidates' forums, Sharon Barovsky was asked about her political machine and alliance with Andy Stern. Both times she adamantly denied being a part of any such team. This weekend, campaign yard signs have cropped up all over town. I noticed that every house that featured a Barovsky sign also featured a Stern sign. Looks like a political alliance to my neighbors and me. We have now caught Barovsky in a lie. What more will she lie about if elected? Or what lies is she telling us now in order to get herself elected? Are both of these candidates so devoid of character that they are sending their machine workers Deirdre Roney, Pat Lang, Laureen Sills, Anne Hoffman and Lloyd Ahern out to smear the other candidate's daring to challenge their hold on City Hall? [ They] seem to believe that Sharon Barovsky has created a deep, dark, and dangerous political machine. I and many other Malibuites have volunteered repeatedly to work on numerous local campaigns. If working together in the past qualifies a group as a "machine," then I plead guilty as charged. 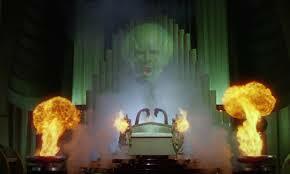 However, I would insist that there is nothing malevolent, dark or dangerous about campaign volunteerism. More people ought to do it. This city deserves a political process that includes all of us." In 2014 the shadow of that "deep dark machine" was still apparently felt: Council candidate Hamish Patterson ran on the platform of being an “outsider to the political machine." This isn’t Soviet Era Berlin. 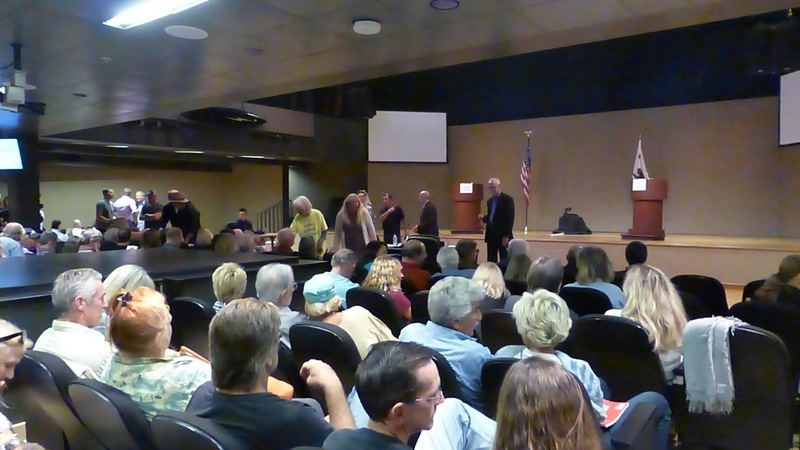 Malibu residents drift from one side of the debate to the other depending on current issues. People on both sides remain neighbors who come together during emergencies, no matter how much they oppose each other’s politics or how nasty the rhetoric becomes at times. Both sides are in favor of public safety and good schools, clean water, and mom and apple pie. When the energy lobby pushed for a massive liquefied natural gas facility off the coast Malibu both sides worked together to defeat it. However, while the so-called Machine side and their opponents may agree on many things and work together to achieve common goals, development remains an unreconcilable divide. 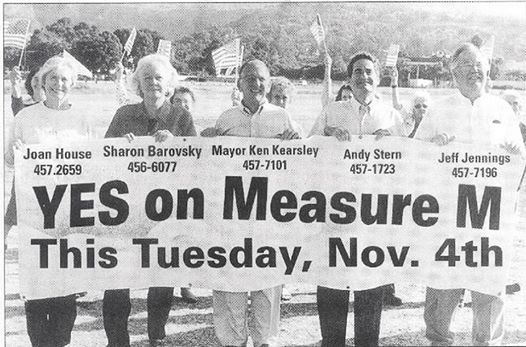 Here's another headline from Malibu's Measure Y election in 1990 that could just as easily be a news story in the 2016 city council election. The Malibu preservationists have always been a loose-knit alliance rather than an organized force. Perhaps the closest the preservation side has ever come to being a well-oiled machine was during the fight for Measure R, when everyone banded together to take on powerful developers proposing a 38,425-square-foot shopping center on the corner of Civic Center Way and Cross Creek Road. Development pressure was the reason Malibu residents sought independence from a county government that was actively promoting a population of 120,000 by 1980. Local activists have fought an unending series of battles against freeways, marinas, high rises, sewers, subdivisions, shopping centers and that infamous nuclear power plant. 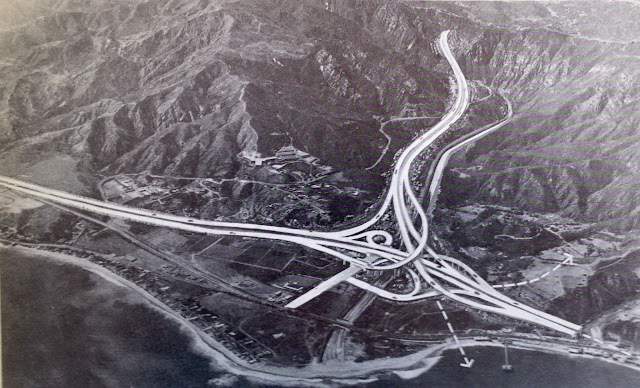 Malibu residents battled dozens of ill-conceived and poorly thought out development projects like this freeway, which would have flattened Malibu Canyon and wrapped the Civic Center area in a serpentine tangle of concrete. It’s unlikely that even the most ambitious developer retains any delusions about the level of development once envisioned, but Malibu has some of the most valuable real estate on the planet and development pressure is a constant. The pro-development faction still views undeveloped land as raw material that should be shaped into a new vision, but instead of the high rise hotels and yacht marines that were promoted in the 20th century, they envision a sort of Beverly Hills by the Sea, where high end shopping and bijou apartments and hotels are a destination. The spectre of nearly two million square feet of new development in and around the Civic Center area was a rallying cry during the Measure R fight and is expected to be a major campaign issue this November. The theory put forward by the pro-develpment side is that taxes from these developments are needed to fund community improvements like ball fields, public art, and landscaping along Pacific Coast Highway. The majority on the city council has often embraced this approach. Things fall apart when the developers, flexible invertebrates that they are, manage to wiggle out through loopholes, like that time in 2009 when the city council approved a 16-year, $1.5 million, interest-free rent deferral for the developers of the Lumber Yard Shopping Center. When they can't exploit existing loopholes, developers invariable attempt to create their own by bending the rules set out in the Malibu General Plan. They do this by seeking variances in exchange for elements they hope the city will find appealing, even when the proposal conflicts directly with Malibu’s general plan and mission statement. The infamous 22,000 square feet (slightly more than half an acre, and double the amount of actual "Park") of "vertical landscaping” a.k.a. 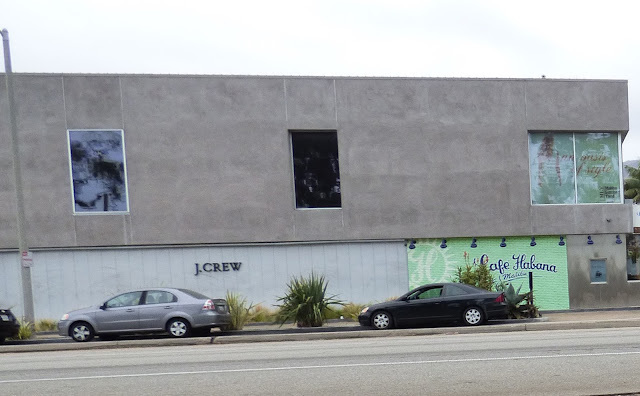 walls covered with potted plants, approved in lieu of open space requirements for the “Whole Foods in the Park” shopping center development is a recent example. 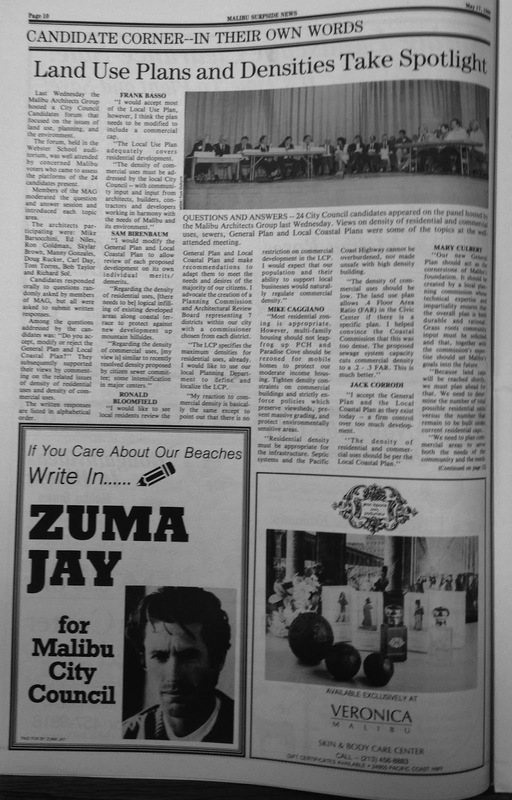 A ten-year-old agreement with the owners of the La Paz property next door to the Whole Foods mall that would permit a 30 percent increase in development density in exchange for setting aside an inconveniently out of the way and partially unusable two-acre portion of the property for a city hall or wastewater treatment facility that Malibu no longer needs is another example. The preservation side of the spectrum embraces the city’s mission statement as Malibu’s Declaration of Independence. Activists on this side of the divide are not interested in shopping destinations, do not care if PCH is landscaped as long as traffic is moving, and would prefer that all development fall within the existing guidelines. They counter what they view as over-the-top projects with appeals to the Coastal Commission, litigation, and when all else fails, ballot initiatives. When the current city council approved five mega mansions on the blufftop next to Malibu Bluffs Park in exchange for the donation of a 1.75-acre parcel to expand the city’s active recreation facilities and parking, activists protested in front of the Coastal Commission and succeeded in getting changes to the height and orientation of the buildings to reduce the visual impact, things the city could and should have done to ensure maximum mitigation for the environmental impacts of the project. When the city approved a plan to bulldoze the heritage sycamore on the corner of Pacific Coast Highway and Cross Creek Road to facilitate the La Paz shopping center development mentioned above, preservationists rallied, unwilling to accept the project planner's assertion that chopping down the tree would provide views of “the clear blue sky.” The tree was saved. It turned out that nobody—not even the developer—really thought removing the tree was a good idea, except for that city planner. One criticism repeatedly leveled at Malibu's government is a lack of adequate communication and transparency. If there is in fact a machine it sometimes appears to operate on autopilot. 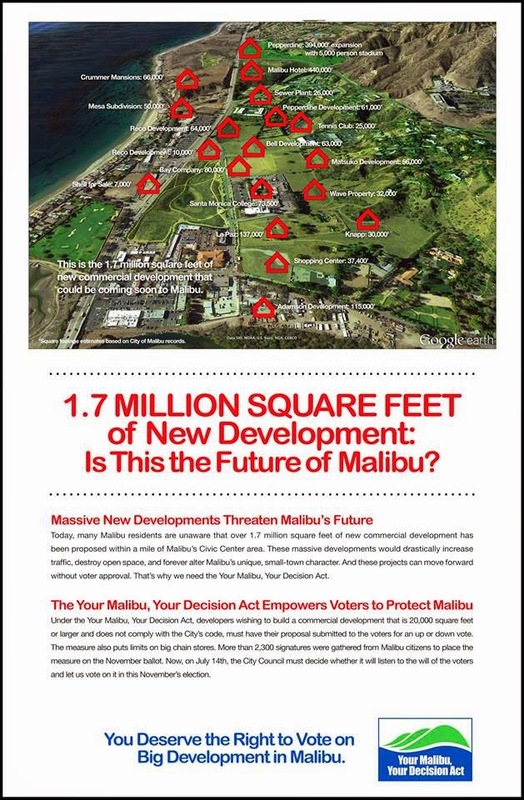 In 2003, the city council negotiated and endorsed Measure M, a ballot initiative that would have authorized 600,000 square feet of new development on 12 Malibu Bay Company properties scattered throughout Malibu, including a 40-unit housing development next to Malibu Lagoon State Park. The development agreement allowed the Bay Company a 20-year approval period and the projects would have been exempt from many key aspects of Malibu’s zoning code, allowing for non-conforming development projects all the way through 2022. 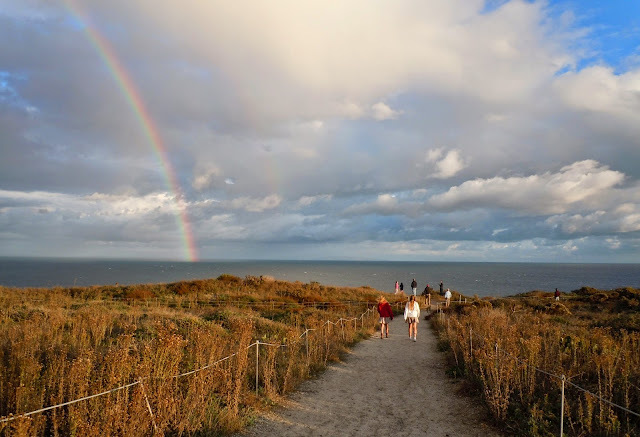 In exchange for all those entitlements, the Bay Company agreed to build a 5000-square-foot community center at Point Dume and offered the city a limited option to buy what is now Legacy Park for $25 million. If the city didn’t raise the funds within two years, the Bay Company would have been entitled to build 155,000 square feet of development on the property. When Measure M was proposed in 2003, it was presented as the only way for the city to ever acquire the land that is now Legacy Park. Because the issue went to a referendum, the voters had an opportunity to call the developer's bluff. In 2006, the owner agreed to sell the property to the city without Measure M's smörgåsbord of development bonuses attached. A different city council cut the ribbon at the grand opening of the park in 2010, just seven years after the Malibu Bay Company issued the ultimatum that Malibu would never get the property unless the community agreed to Measure M.
The city council unanimously approved the Measure M initiative. Their planning commission opposed it. One of the planning commission’s main concerns was “the inadequacy of the traffic planning,” according to a November 3, 2003 Los Angeles Times article by Martha Groves. Voters overwhelmingly rejected the measure. 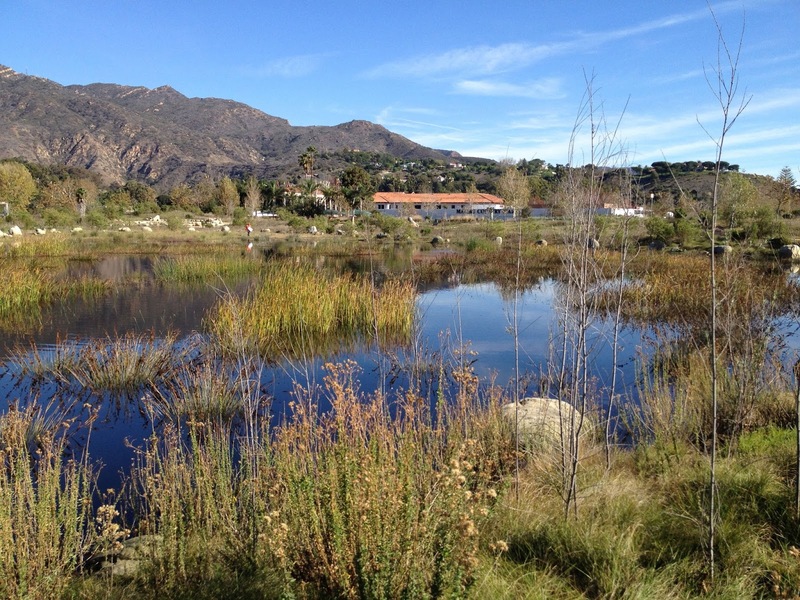 A few years later, the City of Malibu was able to purchase the entire property that is now Legacy Park without the development agreement. The 40-unit subdivision site next to the lagoon that would have been facilitated by the Measure M deal has also been retired from development. It will be transferred to State Parks after the owner's death. More than a decade after the Measure M debate, traffic issues continue to be a major concern in the Civic Center area. 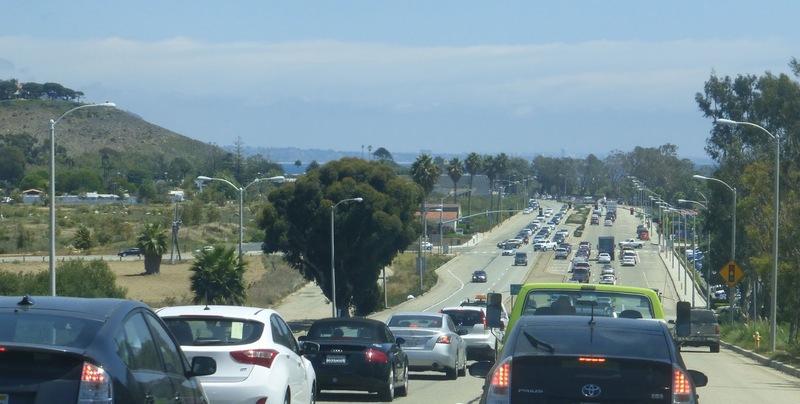 The city addressed this concern during the Measure R debate with a traffic study that found “no increase in traffic in the past 20 years.” A finding that elicits incredulity, in light of the fact that an estimated 15 million people visited Malibu last year. The current council continues the tradition of variances for big developers. Four of the five council members opposed Measure R, the grassroots voter initiative that limits chain stores and empowers Malibu voters to weigh in on development projects over 2o,000 square feet. The only council voice in support of the measure was Skylar Peak. 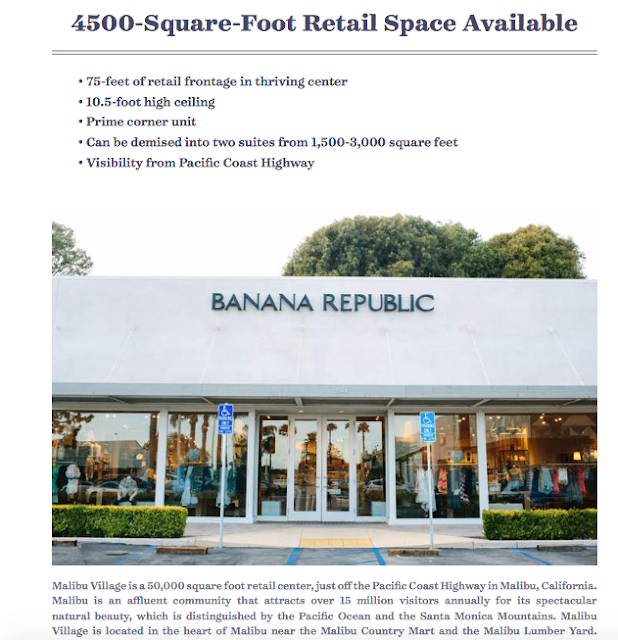 This ad for the vacant 4500-square-foot space previously occupied by the now defunct Banana Republic store boasts "this affluent community attracts over 15 million visitors annually for its spectacular natural beauty." Malibu residents passed Measure R by nearly 60 percent. When development interests challenged the law in court, the city council reluctantly agreed to enter into the appeal process only after Malibu residents raised $50,000 to fund their own appeal. Sharon Barovsky, Joan House, Jeff Jennings, Andy Stern, John Sibert, Lou LaMonte, Laura Rosenthal and Ken Kearsley actively opposed Measure R. Most of these names were also at the top of the Yes on M list a decade earlier. These five former mayors are regarded by conspiracy theorists as the core of the Malibu Machine with Sharon Barovsky as a kind of queen bee. Accusations of a shadowy machine were already being made during the second city council election, just two years after Malibu incorporation, long before Barovsky stepped in to finish her late husband Harry Barovsky's term in office in 2000. This group, however, was the driving force behind the Measure M development agreement, defeated by a landslide in 2003, and among the most outspoken opponents of Measure R.
Measure R's supporters included Malibu’s first mayor Walt Keller, as well as former Mayor Jefferson Wagner and current councilmember Skylar Peak. Wagner and Peak are running for second terms on the city council on a slate with first-time candidate and Measure R activist Rick Mullen. 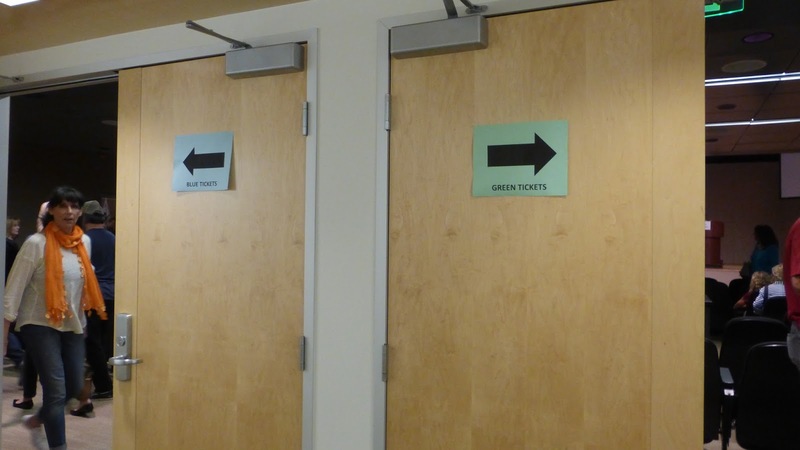 There was just one debate on Measure R. Bowing to pressure from the developer, the city agreed to limit tickets to the city hall event and to segregate the audience: blue tickets were assigned to Measure R's opponents, green tickets to R's supporters. Each side was expected to enter and exit through their own side of the door. There was no middle ground for agnostics. The organizers tried to corral the media into a special corner in back, which didn't go over well. They might have done better putting the elected officials in the corner reserved for media, because four of the five city council members and a number of their friends and supporters sat in the front row on the No on R side, a seating arrangement that may have been based on voting preference but was something of a public relations fiasco. 2016 city council candidates Rick Mullen and Jefferson Wagner were sitting in the Yes on R side right in front of the photographer. Denise Peak, Skylar Peak’s mother and a longtime conservation activist in her own right, is in the photo, too. The Yes on R side of the room was made up entirely of friends and neighbors. The No on R side? Mostly politicians, developers and consultants. There is a letter in this week’s Malibu Times from eight past mayors urging a “no” vote on Measure R. The hard reality is that there is a significant segment of the Malibu population that doesn’t trust the council to fix things. To a degree, this development problem — both actual and potential — got away from all eight of them and the current council is going to have to show they can improve the situation, assuming of course the proposition fails. The eight ex-mayors are all sensible, competent people, but they grossly underestimated the impacts of the Civic Center development. I must confess, so did I. It sort of crept up on all of us and if they get the opportunity again to fix it, they need to act, and act with more urgency than they have in the past. No matter what the results of the Measure R election, if the present council doesn’t deal with the Civic Center development problems in a way that satisfies more of Malibu, I suspect in 2016 a much more radical council could get voted into office. Well, avast ye mateys, Malibu’s rogue group (we’ll assume she meant “Rogue,” as in Captain Jack Sparrow, or Han Solo, as opposed to rouge as in red) won a stunning victory, with 59 percent of Malibu voters approving the measure. Malibu voters also united to defeat Measure W, Steve Soboroff, the "Whole Foods in the Park" developer who is also the mastermind behind the massive multi-billion dollar Playa Vista development once described by the L.A. Times as "one of the most rancorous development deals in modern Los Angeles history," sought voter approval for his mall as required by Measure R.
If Malibu residents are shouting, perhaps it is because they feel they that their voices are not being heard. Nearly 60 percent of Malibu voters supported Measure R and opposed Measure W.
The "Whole Foods in the Park" developer, with the help of the Malibu Bay Company—perhaps still smarting from Measure M—promptly sued. The case is working its way through the appeals process, but Measure R is currently in effect. If the new council supports the ideals of voter-approved Measure R they will be, in the words of preservation activist Peter Jones, an insurance policy should the higher court reject the Measure R appeal. 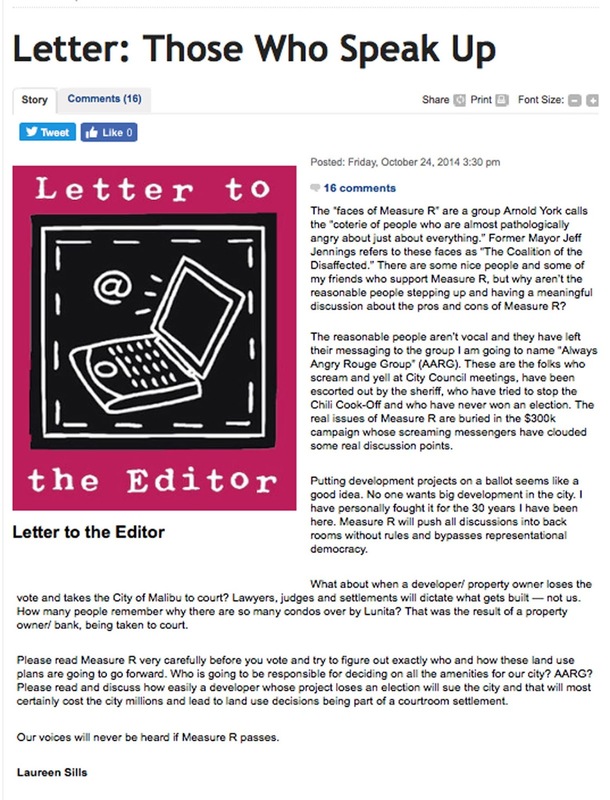 That's because the council has always had the authority to implement the core principles of Measure R.
Sometimes the whole machine vs preservationist battle deteriorates into a kind of slapstick farce, like that time city employees were ordered to remove 70 Yes on R signs from in front of houses all over Malibu. With two old guard council members termed out leaving two empty seats, and a dedicated preservation incumbent running for re-election, the preservation side of the power struggle is hoping that the balance will change this November. However, for a change to take place, the preservationists needs to elect three candidates, otherwise the status quo remains the same. And anyone doubting the pro-development slant of Malibu City Hall has only to look at the speakers panel at the recent Malibu Times-sponsored forum for potential city council candidates. K-Bu journalist Sam Hall Kaplan described it as: "weighted with pro development panelists." A study was released this week that finds developers have destroyed one tenth of the Earth’s wilderness in the past 20 years. That’s a catastrophic loss for everyone and everything. And in its own small way, Malibu is on the front line of that battleground. This 27-mile-long stretch of coast and mountains is a recognized area of special biological significance—a biodiversity holy grail that is one of just five Mediterranean ecosystems on earth. Every developer who lies and cheats and wheedles their way around Malibu’s environmental protections, and every Malibu city planner and city council member who is complacent or who voluntarily trades away open space in variances for things like "vertical landscaping" is complicit in a crime against the earth and against the future. Bad development deals, alas, appear to be part of human nature going all the way back to poor old Esau who sold his birthright for a mess of pottage and ended up with nothing but an empty bowl. That doesn't mean they are inevitable. The November 8 election offers Malibu residents an opportunity to change the future. We just need to choose wisely. What a VALUABLE and INFORMATIVE article. Thank you Suzanne for the historical background so vitally important to voters in choosing the truly honest and ethical councilmembers committed to implementing the Vision and Mission Statement of the Malibu General Plan.